Depending on your dress style or your alterations needs,you’ll have approximately 3 fitting appointments. Remember, your wedding dress was ordered according to the largest measurement (between hips, bust and waist), therefore it is likely it will NOT fit properly at your first fitting appointment. At the first appointment your fitter will pin the dress in all of the right places so our sewers can start customizing your dress to your body. This is where the customized Kleinfeld Sculpted Fit process begins. The Kleinfeld Sculpted Fit is our signature alteration technique. 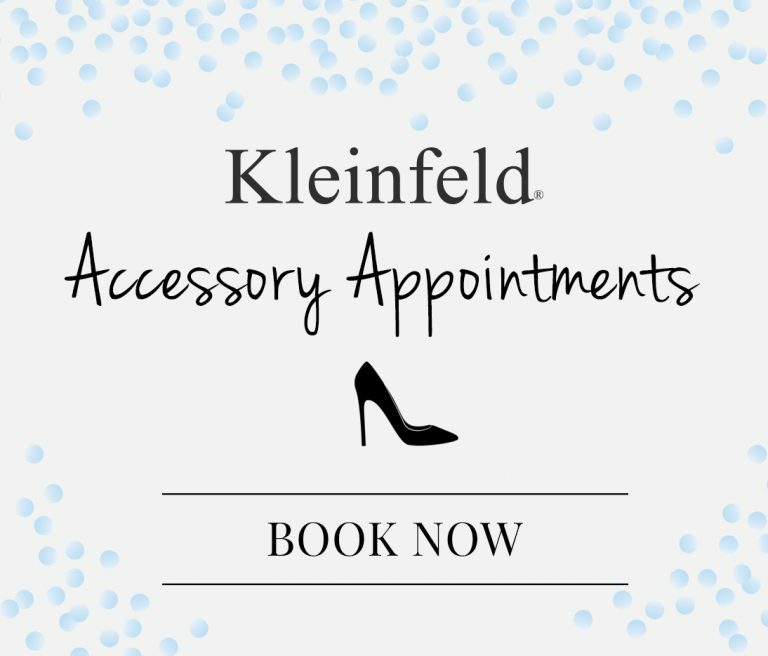 With a staff over 150 fitters, seamstresses, beaders, embroiderers, pressers and fabric specialists, Kleinfeld promises to alter your wedding dress to perfection. No other bridal retailer in the world alters a dress like Kleinfeld does. Your dedicated fitter will properly sculpt the dress to your liking in 3 fittings (or more if needed). Besides properly fitting the dress through your bodice and hips, we will ensure that the hem is completed to your specifications and heel height. Whether an outdoor ceremony on grass, or indoor on a marble floor, we will ensure the hem is to your liking. While the custom fit and hem are in the works, your fitter will also discuss the best bustle options for your train. At your final fitting, we will teach you and your bridesmaids or a family member how to bustle your dress so you can dance the night away. 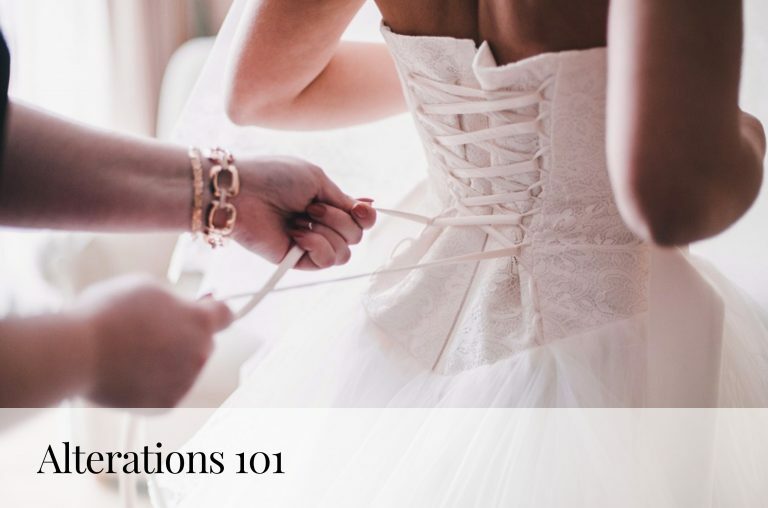 To properly fit your dress, you’ll need to know what undergarments you plan to wear on your wedding day. We suggest that you bring a supportive bra or shapewear to each fitting appointment. If you are unsure about the bra, your fitter will advise you and you can purchase a bra from our selection. You want your dress to be the perfect length on your wedding day—that’s why it’s important to bring your wedding shoes to each of your fitting appointments. This way your dress hem is the appropriate length. If you don’t have shoes yet,you can shop our shoe department for the perfect pair prior to your first fitting appointment (otherwise it might require an additional fitting appointment). If your wedding dress has a train, we recommend adding a bustle. A bustle gathers up the train of your dress to keep the train from dragging. There are a few bustle types to select from which can be secured with buttons, hooks, loops or ties. You’ll work with your fitter and discuss different bustle options for your wedding dress. During quality control, your dress is checked to ensure that each bead, crystal, lace appliqué, sequin, etc. is perfectly in place for your wedding day. After your final fitting, you will make arrangements to press the dress for pickup or shipping. The dress is pressed, steamed and packed with tissue paper so it maintains its shape. The dress will be covered in a opaque garment bag and will be ready to step into on your wedding day. The signature alterations package includes the Kleinfeld Sculpted Fit plus hem and bustle. This takes place over the course of approximately 3+ fitting appointments over a 2-3 month period. At the completion of your first fitting appointment, your fitter will schedule your second fitting which is typically 2-3 weeks later. Your third fitting (if needed) will be scheduled after your second fitting. *Please note the fitting timeline may vary for each bride depending on the dress and alteration requirements. 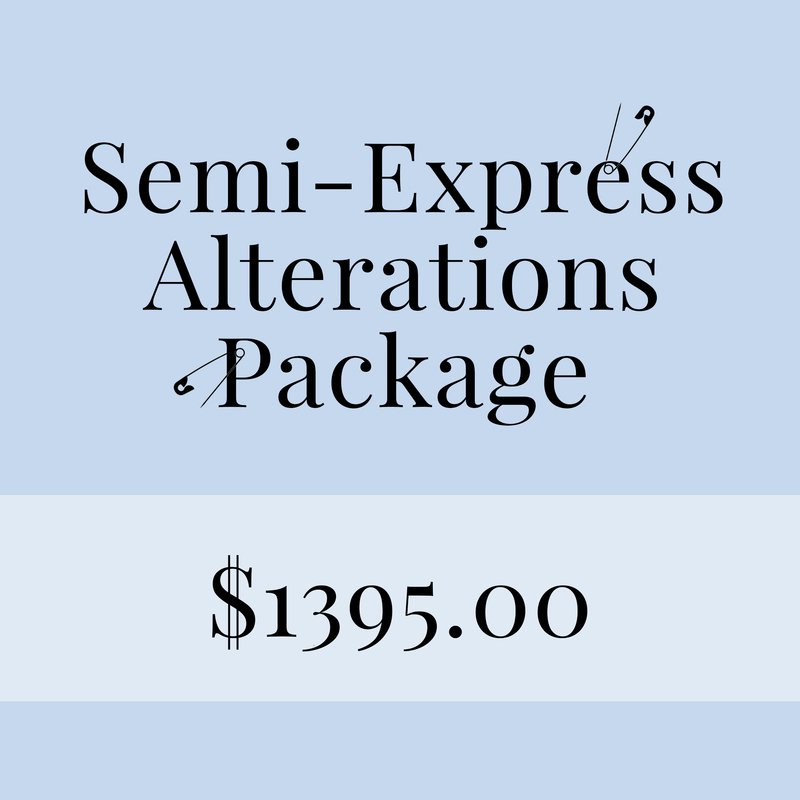 The semi-express alterations package is perfect for out-of-town brides who can return for alterations on two different occasions. This type of fitting may also apply to brides who start the alterations process less than 45 days prior to the wedding date. This package includes the Kleinfeld Sculpted Fit plus hem and bustle. Your first fitting is where most of the alterations will be completed and your 2nd & 3rd fittings will happen over the course of 2-3 days. *Restrictions apply; not applicable on certain dress styles or time frames, call for details. 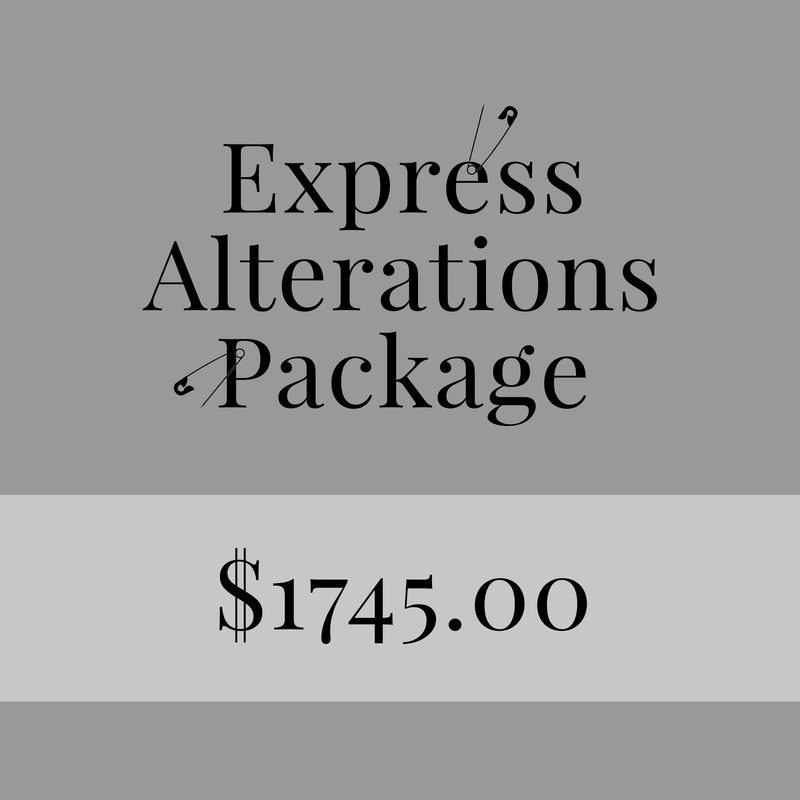 The express alterations package is tailored to international or long distance brides. 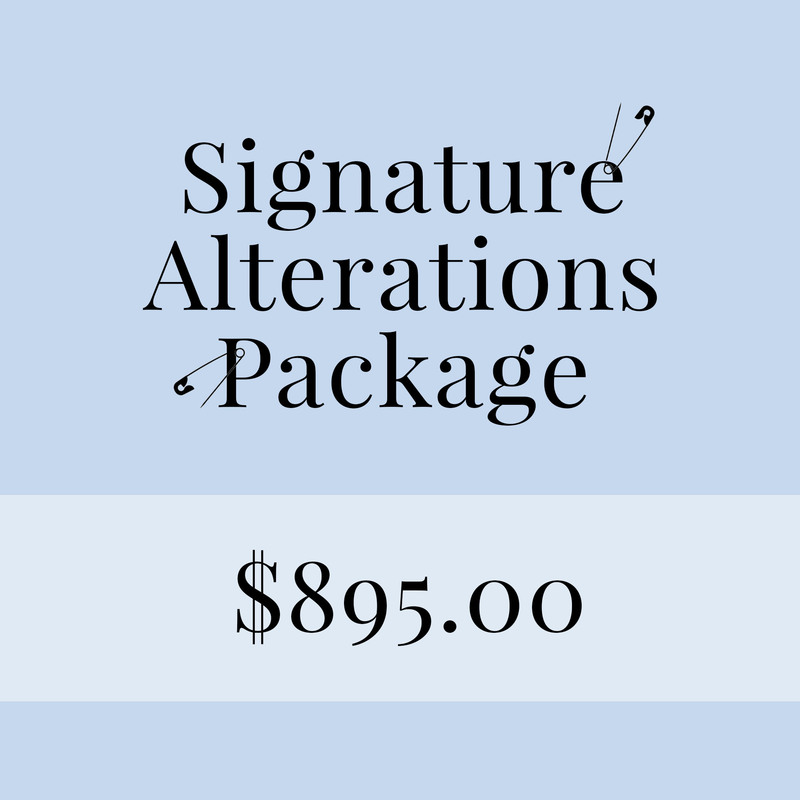 Typically for brides that are in a time crunch or fly-in for alterations closer to their wedding date. This Three Day Express Alterations package typically takes place over Thursday, Friday and Saturday. The package includes the Kleinfeld Sculpted Fit plus hem and bustle. Over the course of 3 days, the bride must be prepared to return throughout the day at the fitters request. * Some designer dresses may require a 5 day fitting. 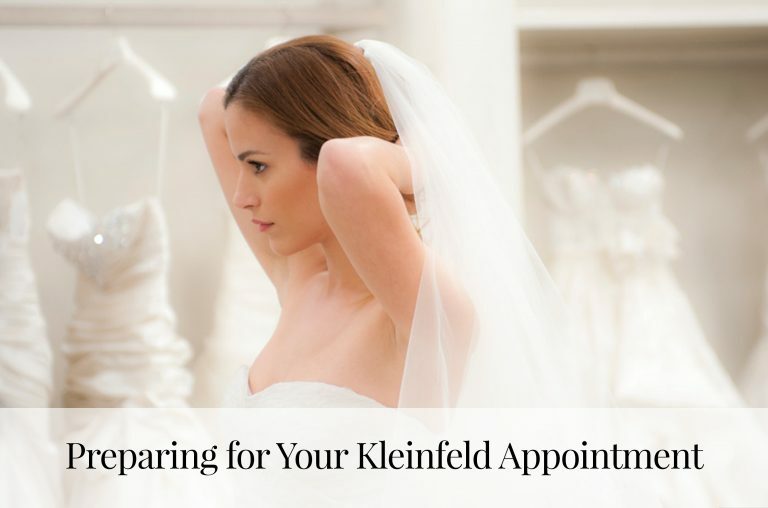 This will be determined by your Kleinfeld fitter and alterations manager. *Restrictions apply; not applicable on certain styles or time frames, call for details.